Order the VIDEO FILE HERE, GMV-957VF. 2017 IFBB ARNOLD AUSTRALIA AMATEUR MEN’S BODYBUILDING - DVD #1. For the first time, you can purchase your own class, and have the edited Video File sent to you by a free video transfer service. A Video File includes the complete class through to the awards. If you are a class winner in an overall posedown this will be included in your file. 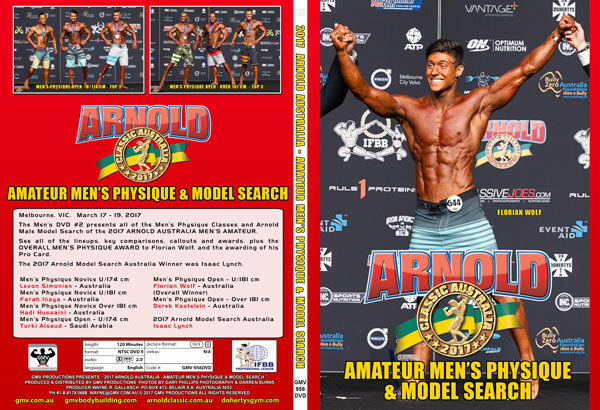 2017 Arnold Amateur Australia – Men’s Physique Results as seen in this DVD including Arnold Men's Model Search.